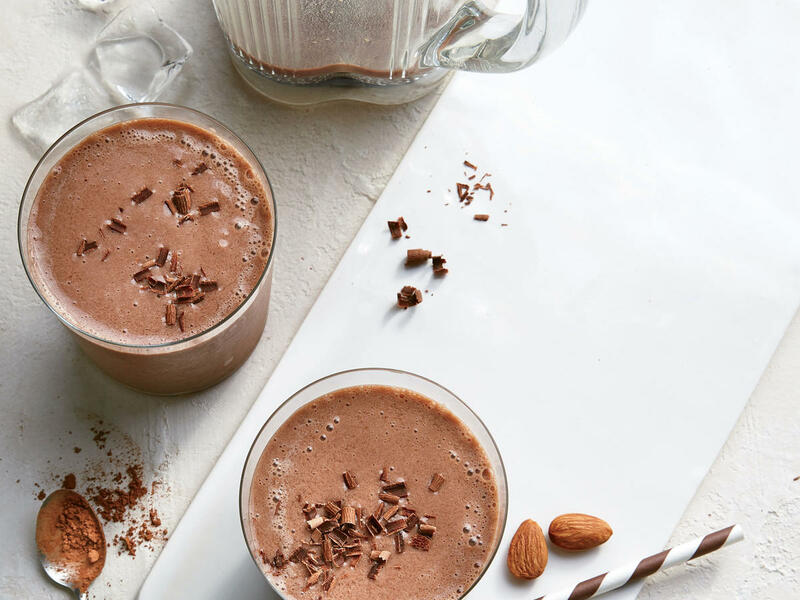 If you just got into the gym scene, or you’re just looking for more post-workout nutrition ideas, allow us to introduce to you your new obsession: the perfect post-workout peanut butter protein shake! There are so many science-backed benefits of having a good post-workout recovery meal like this one. As if we needed a reason to eat more peanut butter and chocolate! Your post-workout meal can make or break the results you get from your workouts. If you aren’t getting in a good post-workout, you’re missing out on replenished energy stores, increased muscle size, and the repairing of muscle damages from your workout. When you do get some good nutrition after a workout, you’ll end up with improved body composition, increased performance, and a reduced injury risk. Nutritional makeup – Healthy fats are amazing, but right after a workout you’ll want to limit them to ensure quick nutrient absorption. As for your other macronutrients, a 3:1 ratio of carbs to protein is generally a safe bet. Protein Count - According to Healthline, it’s recommended that you consume 0.14–0.23 grams of protein per pound of body weight (0.3–0.5 grams/kg) right after a workout. That adds up to 21g-34g for a 150 pound person. Carb Count – This can vary by the type of exercise you’re doing. For example, a marathon runner training for a race will need more carbs than a bodybuilder. A good baseline amount of carbohydrates is 0.5g per pound of body weight (75g for that 150 pound person). Timing – Research suggests that there is a specific window of time after our workouts that our bodies can benefit the most from a post-workout meal. This window of time ends about 30 minutes after a cardio-only workout, and about 2 hours after a strength workout. Protein shakes seem to be the post-workout of choice for bodybuilders everywhere. You could have a whole food meal after a workout and achieve very similar results, but there are lots of great reasons to opt for a shake or smoothie instead. For one thing, a meal doesn’t always sound appetizing immediately after a workout. We’re trying to get some good nutrition in right after a workout, and an ice-cold shake is typically more appealing than, say, a bowl of oatmeal or a chicken salad. A shake will also digest faster, meaning your body will absorb the nutrients faster and there’s a stronger chance that you’ll meet your window of opportunity. 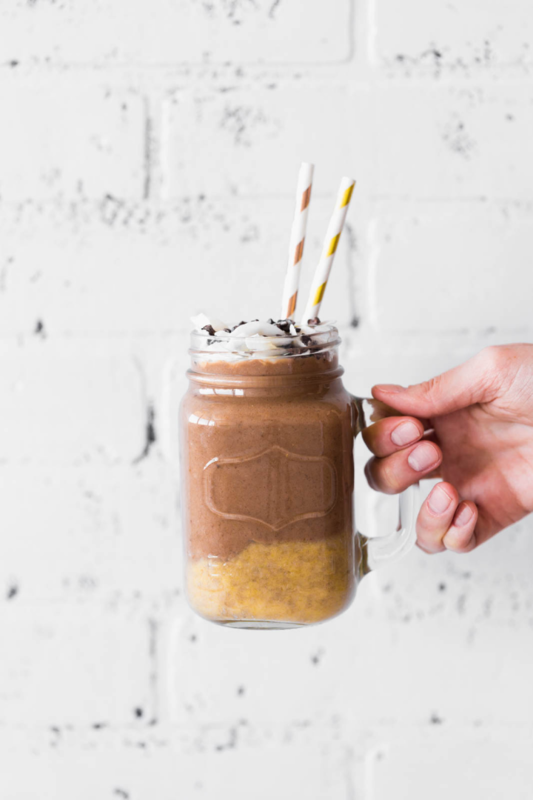 A third reason why shakes may be the best choice is because you can control the nutrient content and include lots of antioxidants, vitamins, and minerals along with your macronutrients. Let’s take a look at some of the amazing ingredients in the post-workout recovery shake recipe below and see what all the fuss is about! Turns out, chocolate is nature’s unlikely bone and muscle rebuilding ingredient! Chocolate may have more benefits than we ever thought for people looking to get healthy and stay fit. Studies have found that polyphenols from chocolate increase "good" bacteria such as Bifidobacteria and Lactobacilli, while also reducing the presence of other potentially pathogenic microorganisms that cause inflammation, gas, bloating, and constipation. And those flavonoids deserve a second look. They have been shown to prevent cancer, lower inflammation in the body as well as blood pressure, and act as powerful antioxidants. Nothing can make us ravenous quite like a hard workout! Adding a little fat from peanut butter into our post-workout shakes will ensure that we feel satisfied for longer after a workout and that we won’t just eat back all the calories we just burned off. Peanut butter also provides a quick little protein kick, which is great for rebuilding muscles and speeding up recovery. You’ll want to make sure to always pair it up with some quality carbohydrates to get to that 3:1 ratio of carbs to protein! Make sure to choose peanut butter with only one or two ingredients. These kinds have no added sugar, are super satisfying, and don’t contain any of those fake additives we don’t want in our bodies. The recipe below also includes a serving of SUTRA Black because of all the gorge things it can do for us after a workout. Energy – After a hard workout your energy levels might take a dip. SUTRA Black helps by providing natural, sustained energy as well as an extra endorphin boost. Detox – If you’re on a mission to get healthy, that probably means you’re also detoxing from not-so-healthy things such as sugar and caffeine. The ingredients in SUTRA Black can speed this process along while also gradually absorbing unwelcome substances like pesticides and chemicals from your body. Metabolism boost – Two of the ingredients in SUTRA Black, cinnamon and cayenne, are metabolism-boosting superstars. Your workout and post-workout shake will be like a one-two punch against unwanted body fat! Blend everything up with a high-power blender until all the chunks are gone. Sprinkle a little more cinnamon or cacao on top, if you want, and enjoy right after your workout. Not everyone is a fan of protein shakes, and that’s totally fine!